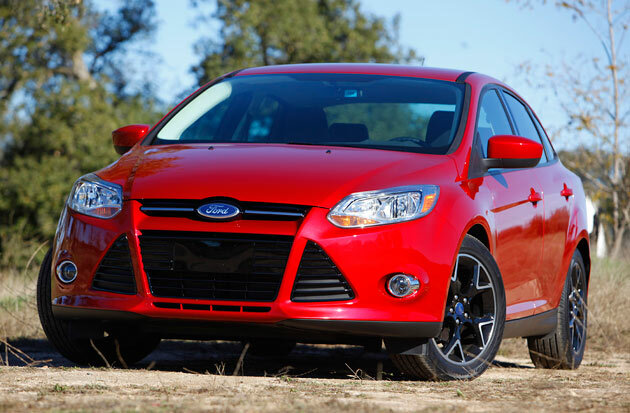 Ford has confirmed that the 2012 Focus achieves an EPA-rated 40 miles per gallon on the highway, besting many of the competitors in its class. Only the 2011 Hyundai Elantra and 2011 Chevrolet Cruze Eco manage to reach the much-heralded 40-mpg mark. The Focus is also rated at 28 mpg in the city. Not to rain on Ford’s parade here, but we must make something perfectly clear: The 40-mpg rating only applies to the Focus SE sedan with SFE (super fuel economy) package and the six-speed automatic transmission. In order to achieve 40 mpg, the SFE package adds unique 16-inch steel wheels with aero-enhanced wheel covers, active grille shutters, a rear spoiler and high-efficiency tires. That might not seem like a big deal, especially when a car as stylish and well-built as the Focus puts down 40 mpg highway. However, we can’t overlook the fact that Hyundai’s Elantra nets that 40-mpg figure on all models with either transmission, and if you spec a Cruze Eco with a manual box, you’ll be running at 42 mpg on the highway. Still, keep in mind that the Focus, at 160 horsepower, is the most powerful car in the group – besting the Elantra by 12 hp and the Cruze Eco by 22 hp – which is something that enthusiasts must consider.